The Caring Place Community Kitchen celebrated the end of another great session by dining out. We would love to take a break from laboring in the kitchen. Minnie was asked to bring us to a Korean Restaurant. Minnie, thank you for being our Korean culinary guide again. 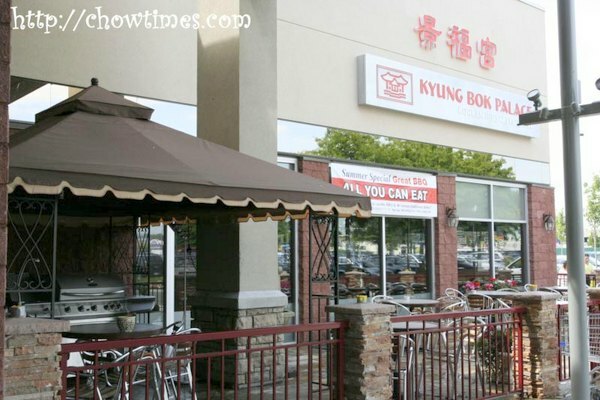 She brought us to Kyung Bok Palace which located at the Lansdowne Mall in Richmond. 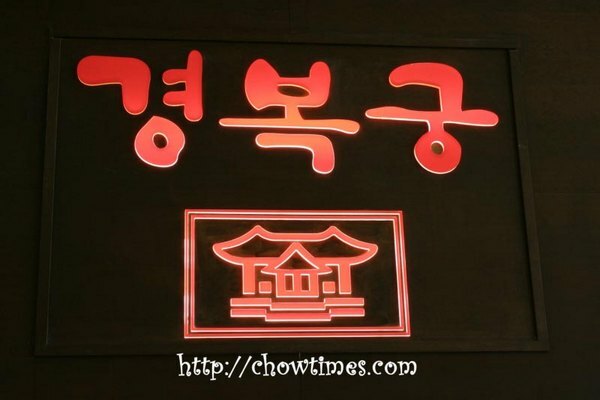 I love this bright red signage on the dark wall of the restaurant because it stands out very clearly although I cant read the Korean language. Kyung Bok Palace also has patio seatings and it’s just great for their all you can eat BBQ which is only served in the summer evenings. One good thing about Kyung Bok Palace is there is a sample of the dishes served in the restaurant displayed outside the restaurant. These displays are common in the Asian countries. This is a good way to advertise and bring customers in as many will not dare to try new food which they have no idea how the food looks like. 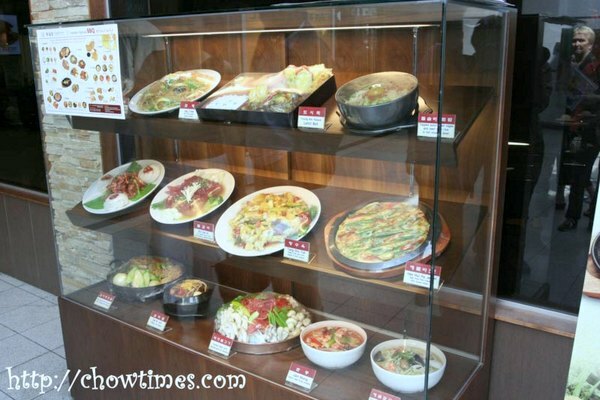 The pricing displays along with the model dishes also helps as one can expect how much the food costs. 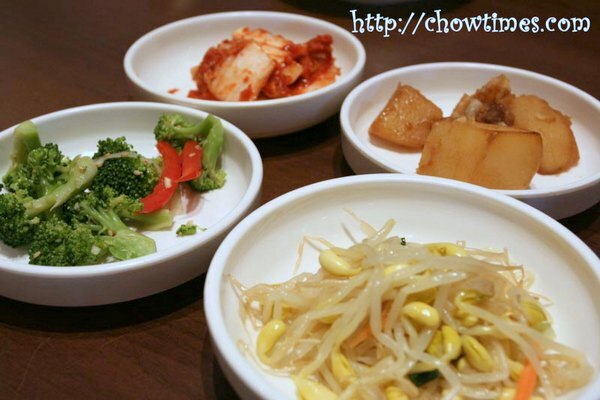 All Korean restaurants serve side dishes like these which include soy bean sprouts, braised potatoes, kimchee and other vegetables. You can ask for refill for these side dishes. 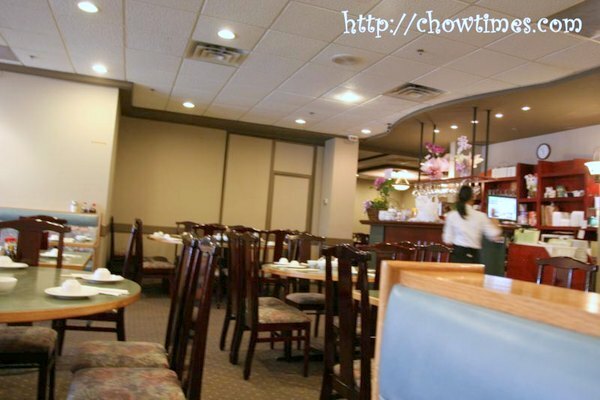 Updated: 12th Jan 2015; This restaurant is closed according to Urbanspoon.com. 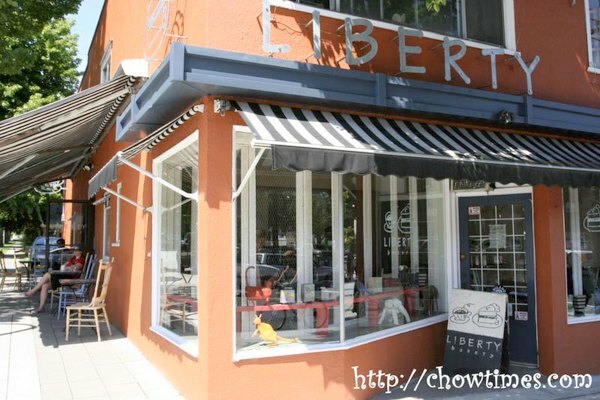 LotusRapper recommended Liberty Bakery to us. Liberty Bakery is located at the corner of Main St and E. 21st Ave. You will not miss this bright orange building. There are street parkings and two parking spots at the rear of the bakery. 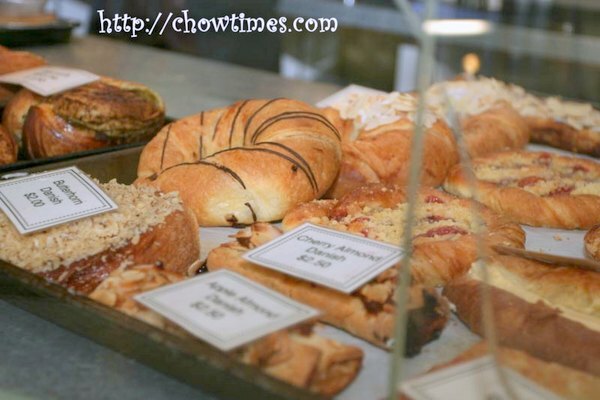 Liberty Bakery is an European style bakery with a Swedish chef. It is just perfect for Polly and me because it opens early, i.e. 8 am. 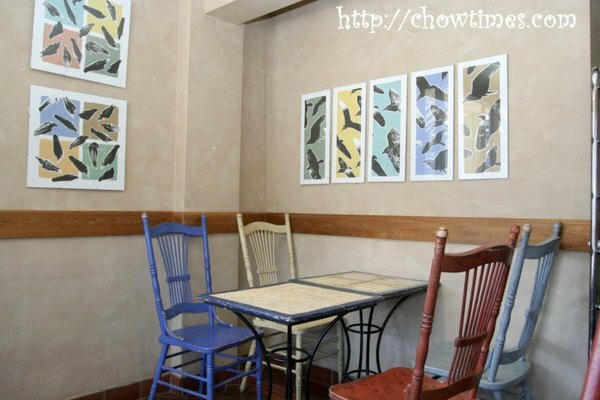 The interior decoration is simple and rustic. The furnitures are made of wood and painted colourfully. The decoration theme seems to focus on crows as there were quite a few crows posters on the walls. 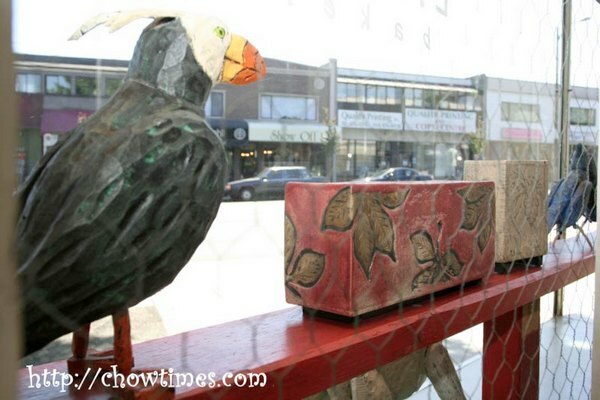 There is even a wooden crow on the display window. Hmm, to the Asians, crow brings bad luck. I wonder what crows means to other ethnic society? 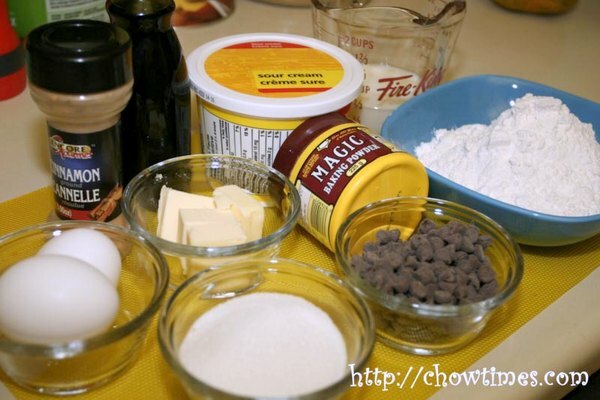 I like to bake cakes but they are all cakes without frosting because I simply dont know how to frost a cake. One day when we were shopping a Michaels, Ben noticed that Michaels offers cake decorating class on a notice board in the store. So, I signed up for it since the course is free with the condition that you buy the student kit for the course. 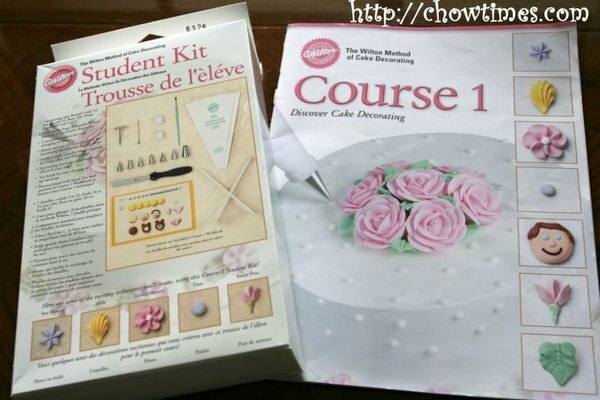 There are four levels in the Wilton Cake Decorating course. Each level has four classes and the class is two hours each on a weekly basis. The student kit for level one costs $29.99 plus tax. The kit consists of some of basic items like a spatula, seven tips, a flower nail, a tip brush, a decorator brush, a practice board set, two 10″ featherweight decorating bags, a disposable decorating bag and two standard couplers. We were given a coloured course material book too. 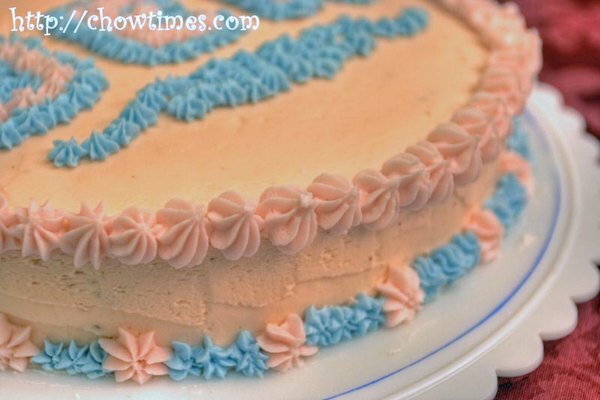 In the course, we were taught how to make different consistency buttercream icing. The different consistency is meant for different decorating tips. 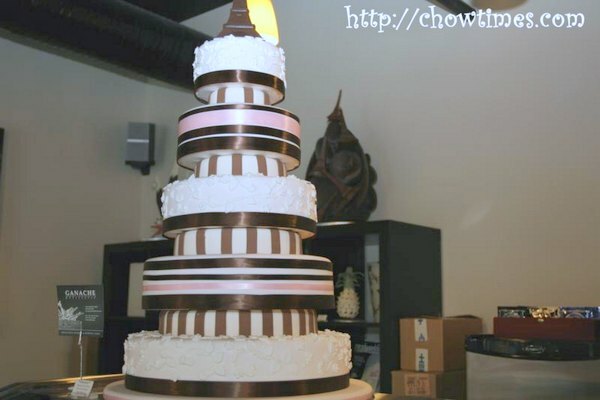 For example, thin consistency is for the base icing for the cake and printing. The medium consistency is mainly to create motives using tips while the stiff consistency is for creating larger motives like a rose. Well, I would not know all this without going to a course like this. We also learned how to prepare a cake for decorating; from baking, leveling, torting, filling and icing the cake. Before we start to create motives with the different tips, we learned about the correct bag position with the right angle and direction. We also learned about pressure control to create different size and uniformity of the icing designs. It seems like a lot to learn but you will get the hang of it with practice. Finally, we got to decorating our cakes. We have to prepare a cake with icing to bring to the class so that we can decorate it after we learn how to using the icing tips to create different icing motives. This the my first decorated cake with mainly star tips. 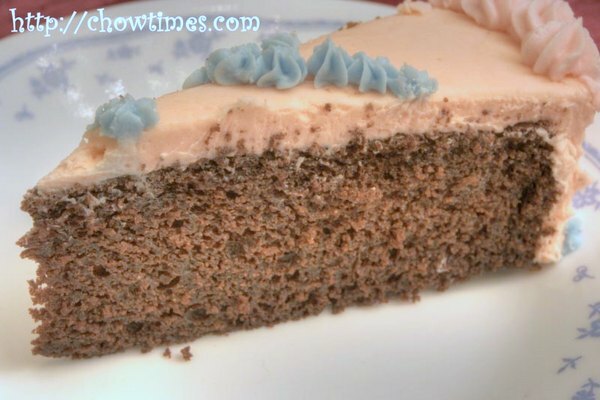 I made a chocolate cake base as my kids love chocolate cake. Updated: 4th Oct 2010: This restaurant is closed via Vancouver Sushi. The Gilmore Park Church community kitchen opted to eat out on the last day of our meeting before the summer break. 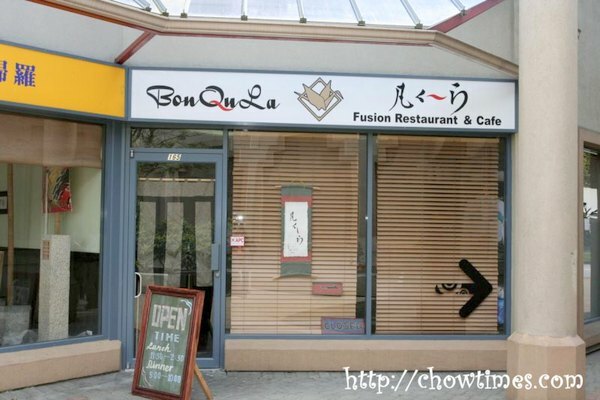 Lorna suggested to eat at BonQuLa Fusion Restaurant and Cafe at the Olympia Centre in Richmond. 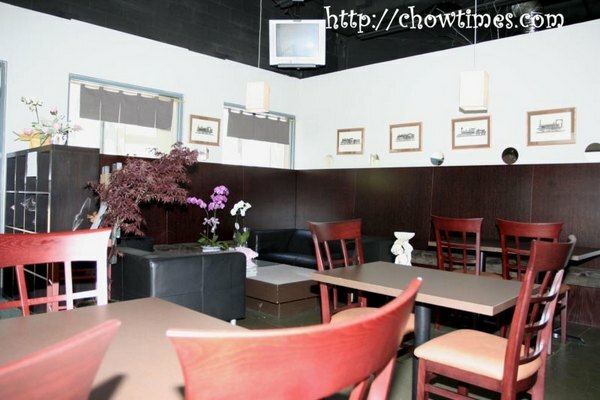 The restaurant is located at #165-8460 Alexandra Road; the strip mall across Toys’R’Us in Lansdowne Mall. This is a very new fusion restaurant, less than a month old. The owner of the restaurant is an ex-member of the Gilmore Park Church community kitchen. The chef of BonQuLa is the daughter of the owner, her name is Kaori Kuruyama. Chef Kaori was a piano teacher in Japan, but she changed her career after she came to Canada. She studied French cuisine at the Culinary Arts in Vancouver Community College. She is creating her own fusion food with her Japanese inheritage and her French cooking skills. The word ‘Bon’ means ‘Ordinary’, the word ‘Qu’ means ‘Eat’ and the word ‘La’ means ‘Enjoy’. 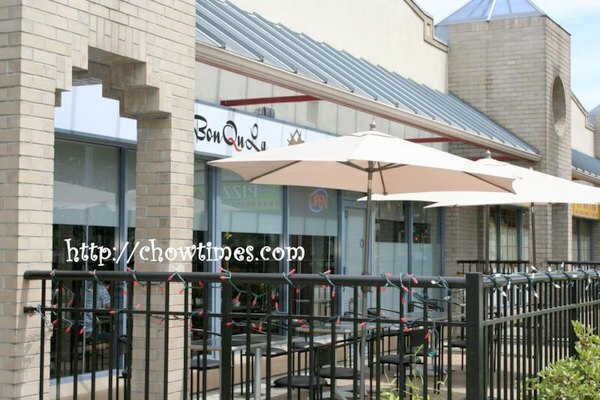 The owner named the restaurant BonQuLa because they want the customer to enjoy their food comfortably. 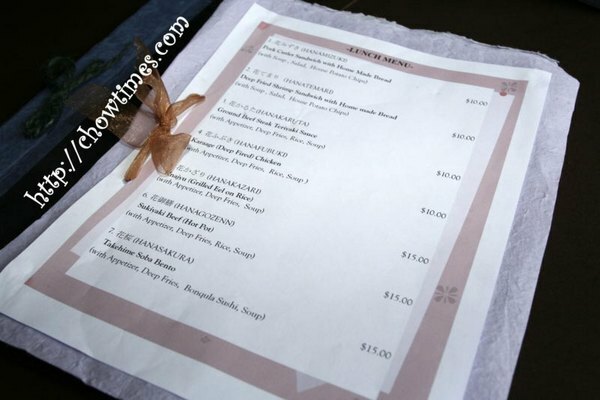 What stands out to us is the menu which is made of handcrafted paper. A simple but unique menu. We did not place specific orders but asked the chef to recommend some of their signature dishes. 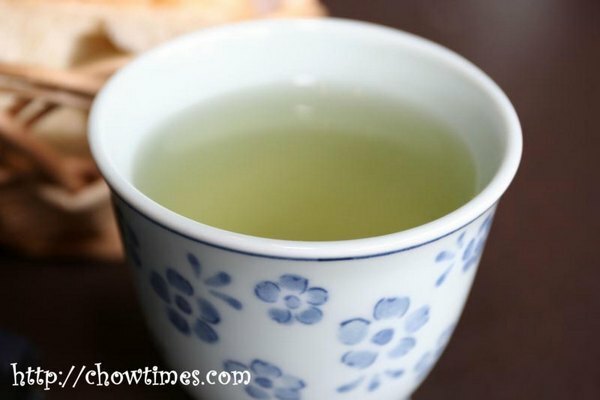 Like many Japanese restaurants, we were served hot green tea. However, they did not place a teapot on the table for us to help ourselves. They served the tea to us instead. First came the bread baskets like most western restaurants. The difference is they served soft and sweet bread instead of crusty bread. 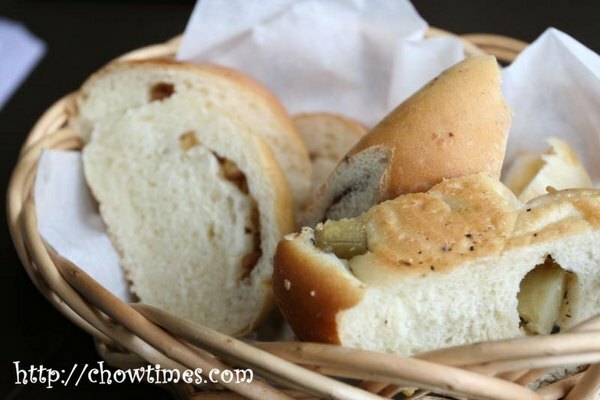 The bread basket has a variety of sweet bread like chocolate bread, walnut bread and sweet potato bread. I like these breads. I understand from Kaori that bread baking is her passion and she enjoys seeing her customer enjoying her bread before a meal. Next is a Green Field Salad. 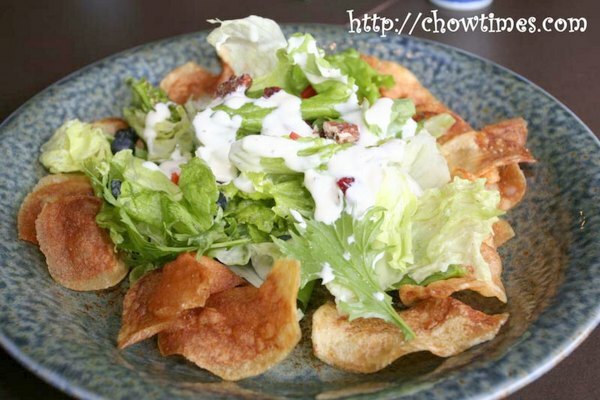 The salad is accompanied with homemade potato chips. The salad is mainly made of lettuces with fresh blueberries, walnuts and dried cranberries and some other dried fruits. 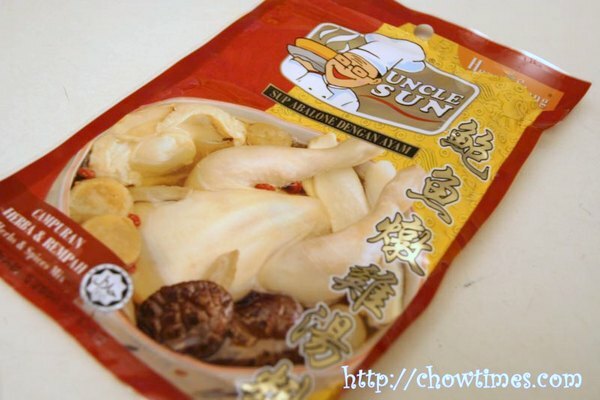 Vincent gave me this pack of Chinese Herbal Soup to try. He recommended this to me as he said that it’s a simple soup to make and it tastes quite nice. All you need is to add 3 liters (6 bowls) of water and a whole chicken, cut into four pieces. 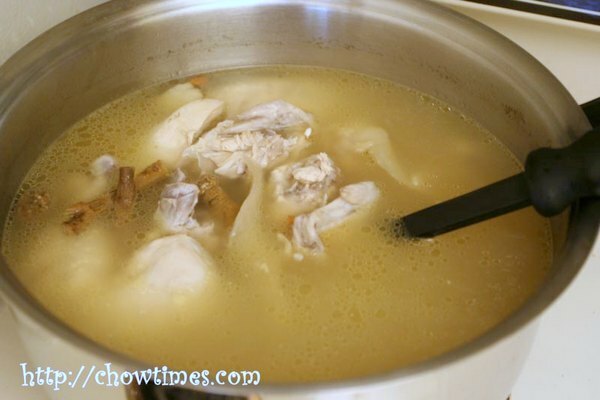 Bring the water to a boil and add the chicken and the contents of the soup pack and simmer on low heat for 2 to 2.5 hours. The soup has slight hint of abalone and Chinese herbs flavour. Its just the kind of soup we like, clear and mild in flavour. Vincent, thank you for recommending this soup to us. Update 11-Dec-2008: This restaurant had closed down. In it’s place is the Szechuan Harvest Moon Cuisine. I think this place is new. I am sure that there was a Chinese restaurant in this location before but we had never walked in. Anyway, I am talking about the Empire Square along the No 3 Road. It’s in the same strip mall as Hon’s. Oh, talking about No 3 Rd, wouldn’t you all say that it’s a complete mess with the Canada Line construction? We were there just after 5 pm. and the place was still quiet then. It was pretty spacious with lots of tables that extended even to the back. They initially gave us the menu in Chinese and we had to ask them for one in English. For a moment we thought we are in one of those all-Chinese restaurant where they not only do not have menu in English, the waitresses does not even speak English. With our poor Mandarin and all, we would have walked out. 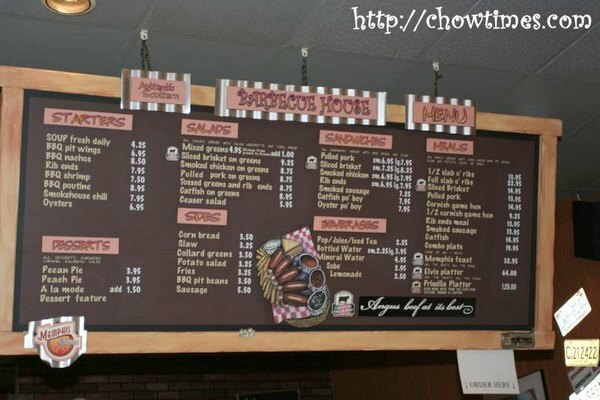 Well, well … we certainly liked the way their menu is laid out. Their popular Set Dinner Combo menu is priced by the number of “dishes” you order. Since there were just the three of us … well, two and a half … we went for the 2-dish combo which costs $24.80. The 4-dish combo ($45+) would have been too much for us. The Set Dinner Combo menu has a very wide selection of dishes. We counted about 77 in all. The Combo also include all-you-can-eat rice, soup of the day and dessert. 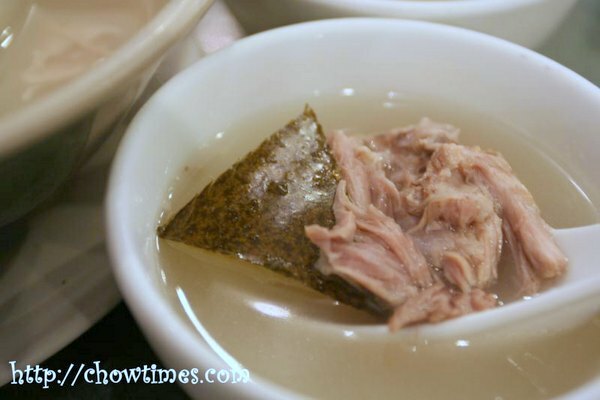 The soup of the day was winter melon and pork soup with some herbs and barley. It was absolutely delicious. Back to basic baking, I made some Chocolate Chip Sour Cream Muffin for breakfast. 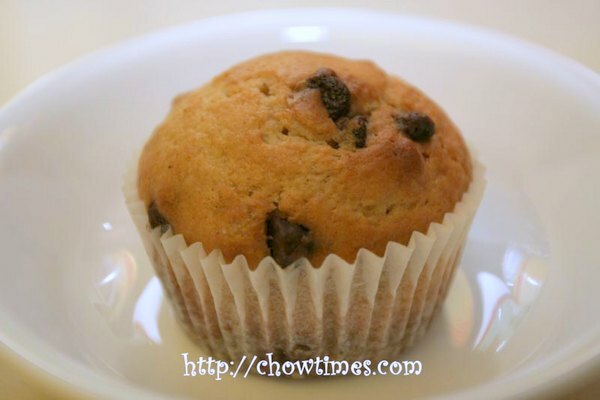 Muffin is little cake that can be prepared quickly. 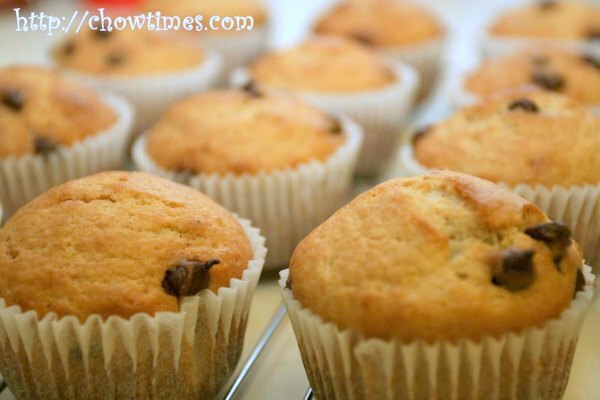 This muffin recipe has cinnamon in it and I love baking with cinnamon because the kitchen will be filled with the aroma of cinnamon as when the muffin is baking. 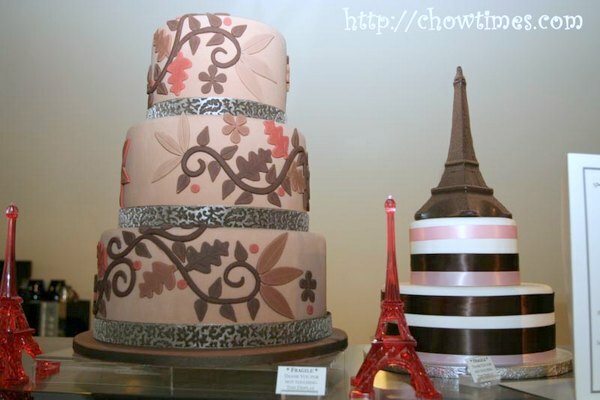 Ganache Patisserie is a cake shop which specializes in chocolates, pastries and wedding cakes. 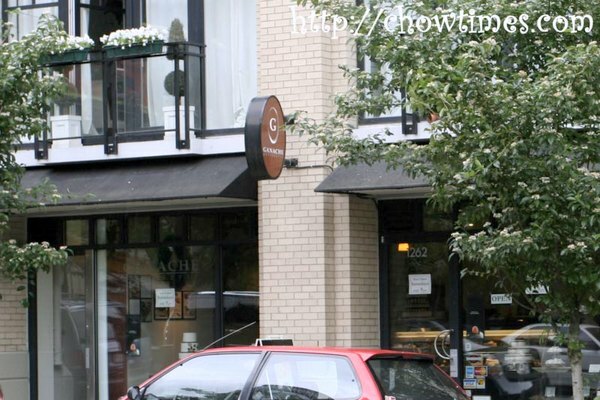 It is located at 1262 Homer Street in downtown Vancouver. There are street parkings all around and this place is easy to find. Ganache specializes mainly on wedding cakes but there are three small tables for people to sit in to enjoy the single serving cakes with coffee and tea. I organized a after work dinner on a Friday some time back, primarily as a treat to the contractor folks who had their contracts ended. It was also an excuse to just take the time off to relax after another hectic week at work. 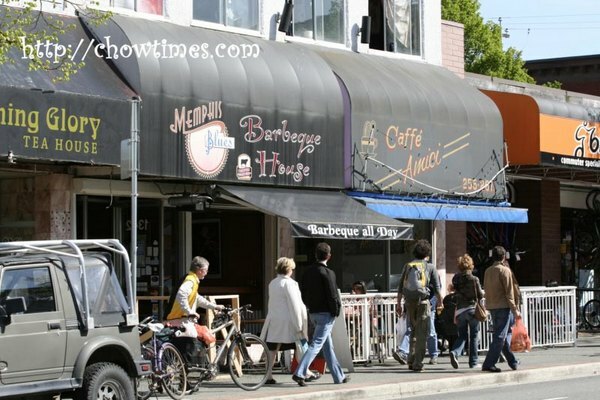 The Memphis Blues BBQ House (http://www.memphisbluesbbq.com/) had a few locations. 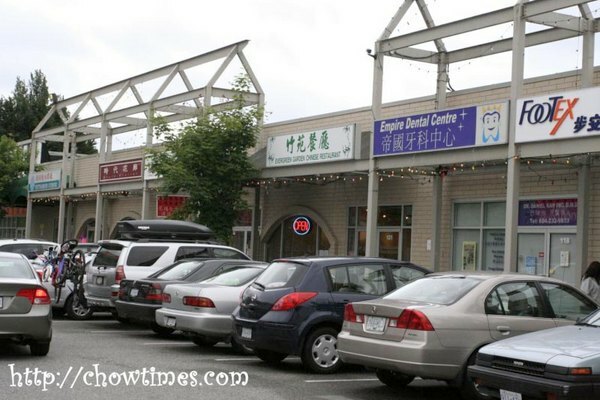 They have locations in Commercial Drive, Broadway, North Vancouver and Kelowna. We went to the one nearest the office … in Commercial Drive. The Blue Memphis is described as specializing in authentic Southern BBQ. My image of southern BBQ is the presence of pork, not just beef. This restaurant had really limited seating. So, if you have a big party, you better arrive early. We went just after 5pm. The dinner crowd will come in before 6pm. Oh … big advice … they don’t take reservations at all. If there are only two of you, you should try their $32 Memphis Feast. For us, we had 14 people in all. So, we decided to order their largest offering on the menu. It’s called The Priscilla and is supposed to feed 10-12 people. It came in two large platters — trust me — they are so large that when placed on the table, the ends touches both end of the table. If you have that many people, you MUST order The Priscilla. This is the ultimate, the works, everything you ever want. 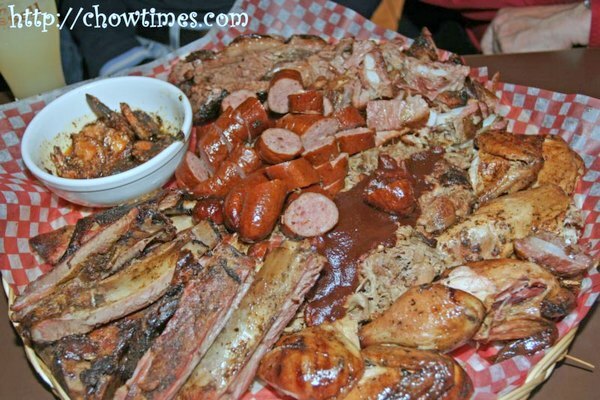 The first platter is the main platter … and it includes huge sausages, chicken, briskets, pull pork and the best of the lot, ribs!! When they brought it out to our table and placed it in front of us, I can see the delight in everyone’s eyes, even the girls’! Almost everyone ooh’d and aah’d. Just visually looking at it brings so much delight. I am happy … I am a very happy man! The second platter is the seafood and salad platter. Not as many oohs and aahs as the first one but still it drew quite a bit of wows. There are oysters, shrimp and, my favourite, the fried catfish — yummy! 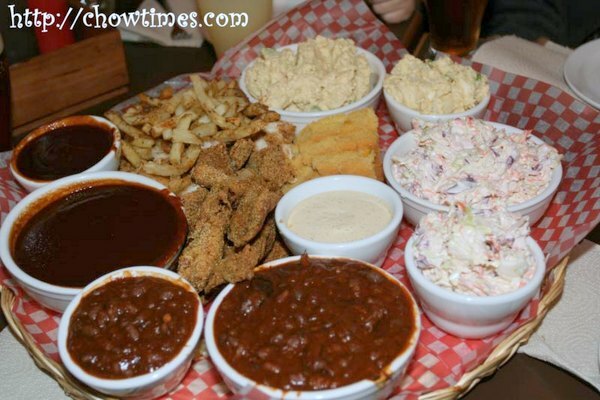 The rest of the stuff on this platter are corn bread, BBQ Pit Beans, Slaws, Potato Salad and Fries. These are meant for 10-12 people but we had 14 people … and yet this is more than enough to make everyone happily fed. The thing about Memphis Blues is not just the food but the very informal setting, people eating with their hands and it’s downright fun tucking in together with friends. Their beers are really great, we had jugs after jugs of them. The way I calculate it is that it will cost about $17 bucks on the average, including drinks/beer, tips and taxes. Not bad right? I had a great time and so did everyone. It was a great way to cap off a long tedious week. Go grab a few friends and try this place out … I am sure you will like it. I made Lemon Coconut Bars for the Richmond Community Kitchen Open House. 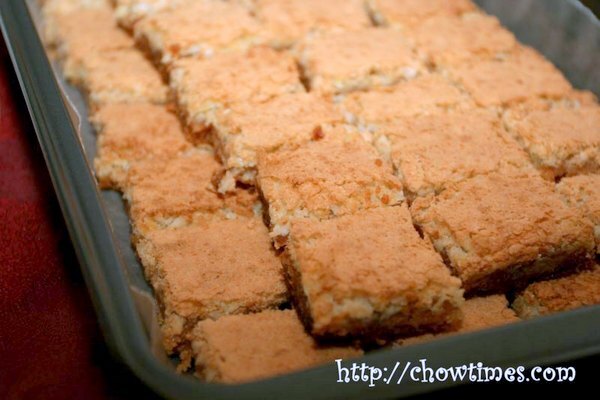 These Lemon Coconut Bars are ultra sweet and you should enjoy it only once in a blue moon. I thought it should be perfect for potluck where each person will only try a small piece. 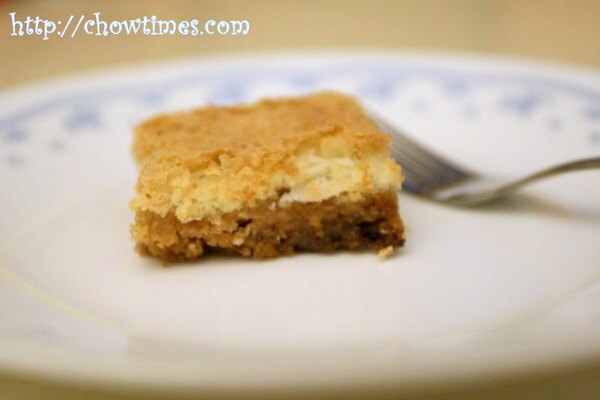 The Lemon Coconut Bar is rich with coconut aroma and lemon flavour. The base of the bar is crispy while the top is chewy. It is a bit too sweet even for my sweet tooth. 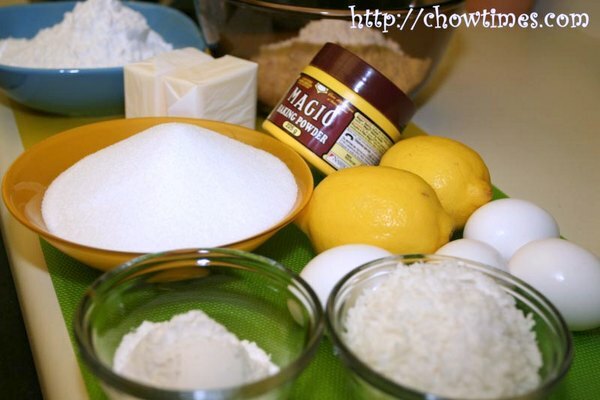 I would recommend to reduce the sugar by half a cup each for the crust and filing.